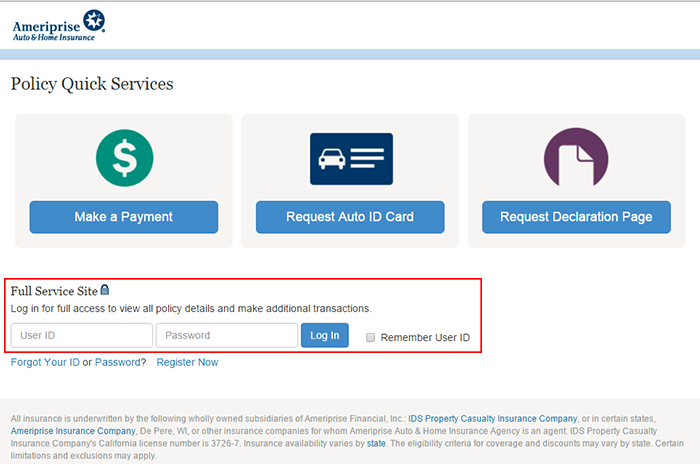 Manage your Ameriprise auto insurance policy 24/7 via the online account management system. Benefits of using this service include the ability to make payments, file claims, update your policy, view the status of claims, view/print/request and download ID cards/policy documents, and more. Payments can be made via credit/debit card, or electronic bank transfer (EBT – via a checking or savings account). Use the tutorials in the sections below to learn how to access your account, register a new account, make a payment without logging in, and how to file a claim online. Step 1 – Right click the ‘Login’ link at the top of the page and select ‘Load in new tab/window.’ The auto insurance homepage will load. 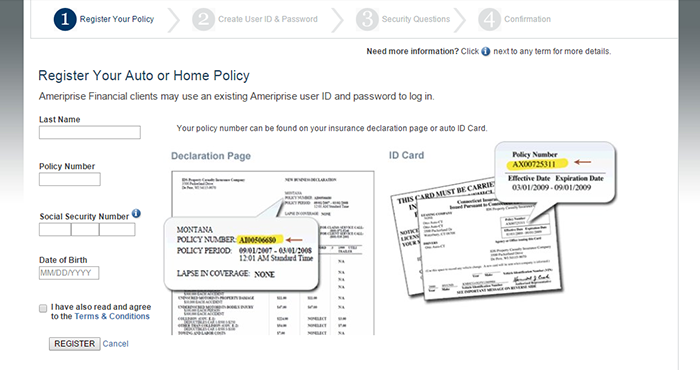 Note: You can also enter www.ameriprise.com/auto-home-insurance into your web browser. 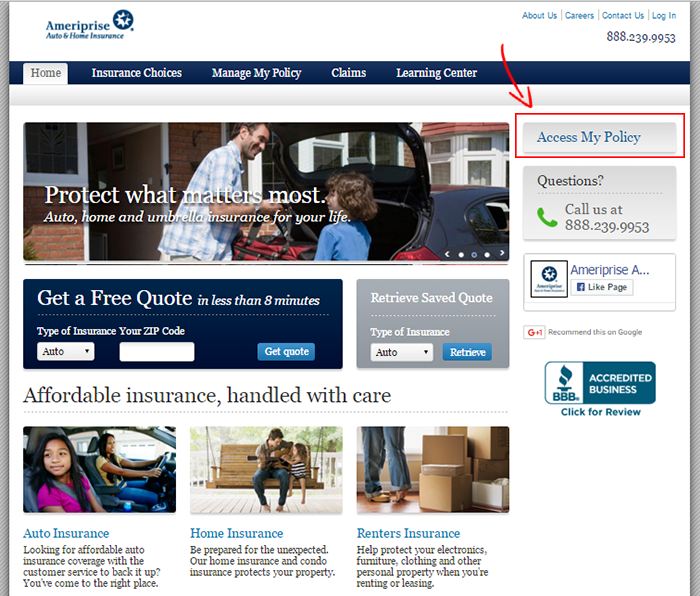 Step 2 – Press the ‘Access My Policy’ link on the right side of the page. Forgot Password – On the main sign-in site (www.quickservice.ameriprise.com – link will open in a new tab/window) click the ‘Password’ link under the ‘Full-Service Site’ login form. The password reset page/form will load. Enter your user ID and click ‘Continue.’ In the remaining steps you will answer your account’s security question, create a new password, and confirm your changes. 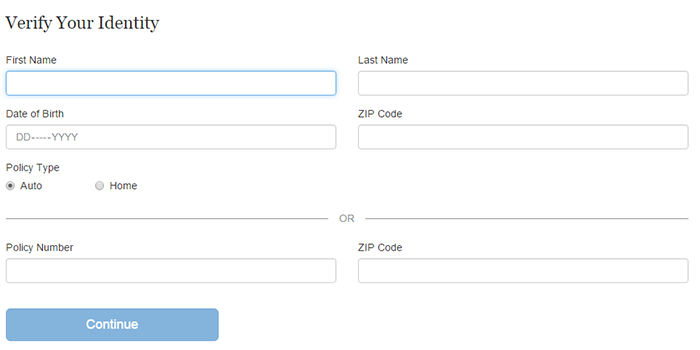 Step 1 – On the main account access site, click the ‘Register Now’ link to go to the four-step account creation form. Step 3 – In the remaining steps you will create your account’s user ID and password, select/answer security verification questions, and then finalize your registration. 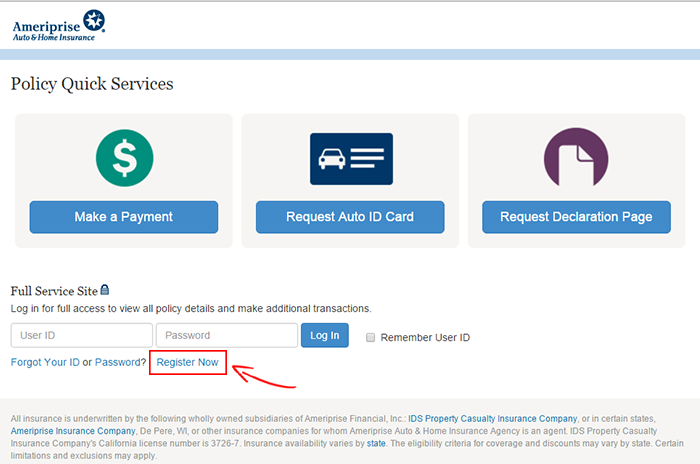 Step 1 – Go to the ‘Policy Quick Services’ page (URL in the ‘Forgot Password’ section above). Click the ‘Make a Payment’ button to load the one-time payment form. Step 2 – Verify your identity by providing your first name, last name, date of birth, and ZIP code OR your policy number and ZIP code. Click the ‘Continue’ link. 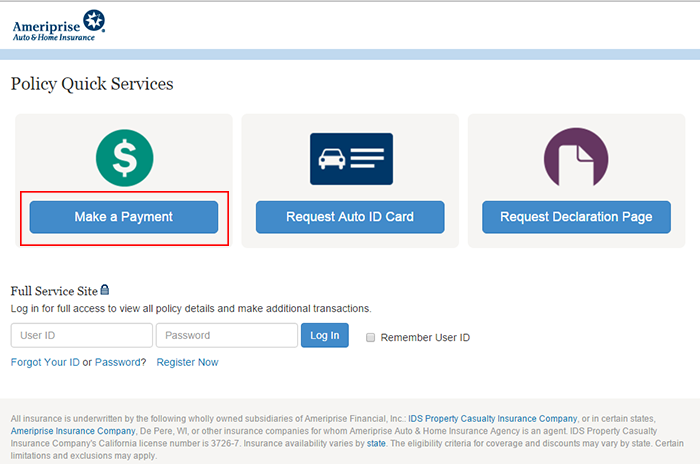 Step 3 – Provide your payment information (credit/debit card/bank account details). To report a claim over the phone, call 1-800-872-246 (available 24/7). Follow the instructions below to file your claim online. Step 1 – You can start a claim online by logging in to your account and filling out the claim form. After filing your claim, a representative will contact you to go over specific details and schedule an adjuster to assess the damage to your vehicle. Note: More information regarding the Ameriprise claims process can be viewed on this page (link opens in a new window/tab). Copyright 2018, www.insurancereviewssite.com . All rights reserved.